The proportion of women of reproductive age (15–44) who were uninsured dropped by 41% between 2013 and 2017, over the first four years of the Affordable Care Act’s (ACA) major expansions to Medicaid and private insurance coverage. This decline was particularly pronounced in states that had implemented the ACA’s expansion of Medicaid to individuals with family incomes below 138% of the federal poverty level. As many as six additional states might implement the Medicaid expansion as a result of the 2018 elections. Yet, threats to coverage persist, as conservatives in the Trump administration and Congress continue to attack the ACA. 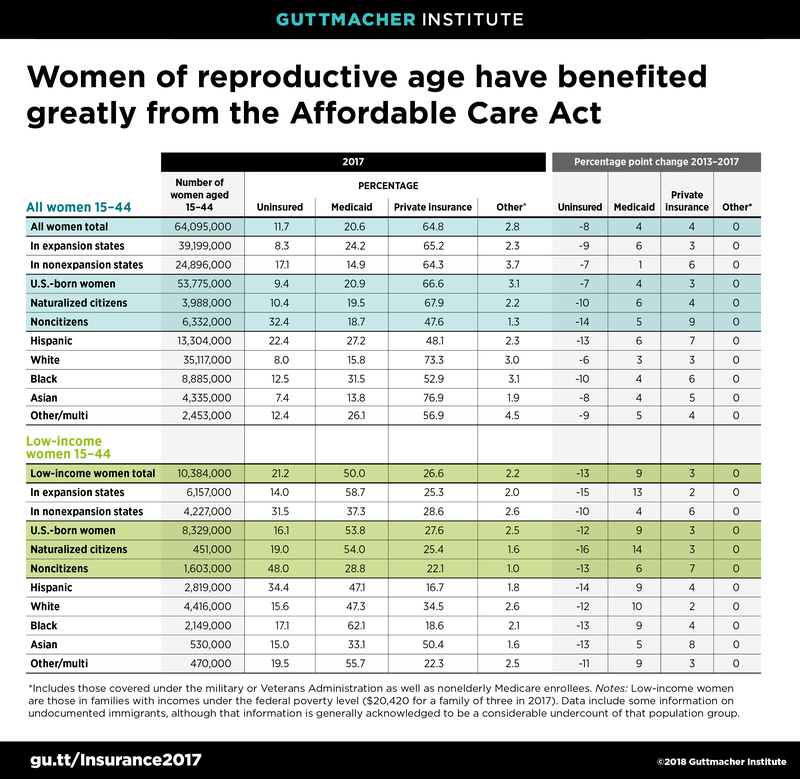 Overall, the proportion of reproductive-age women without health insurance fell from 20% (12.5 million women) in 2013 to 12% (7.5 million) in 2017, as calculated by the Guttmacher Institute, using data from the U.S. Census Bureau’s American Community Survey. Coverage levels remained stable between 2016 and 2017. The change between 2013 and 2017 was driven by substantial gains in both Medicaid coverage and private insurance. Medicaid, the federal-state health insurance plan for low-income individuals and families, covered 21% of reproductive-age women in 2017 (13.2 million). Gains in insurance coverage among reproductive-age women who live below the poverty level were substantial as well between 2013 and 2017: There was a 38% drop in the proportion who were uninsured and a 22% increase in the proportion covered by Medicaid. That program covered 50% of women aged 15–44 with incomes at or below the federal poverty level in 2017. Despite these improvements, women of reproductive age who live in poverty were almost twice as likely to be uninsured in 2017 as reproductive-age women overall. Other disparities in coverage also persist. Hispanic women of reproductive age were far more likely than white, black or Asian women of reproductive age to be uninsured in 2017. Similarly, immigrant women of reproductive age who are not citizens had more than three times the uninsured rate of U.S.-born women of reproductive age in 2017. That gap grew wider between 2013 and 2017, likely because many immigrants are barred from eligibility for subsidized private coverage under the ACA and for Medicaid coverage. In fact, nearly half of noncitizen immigrant women aged 15–44 living at or below the poverty level remained uninsured in 2017. 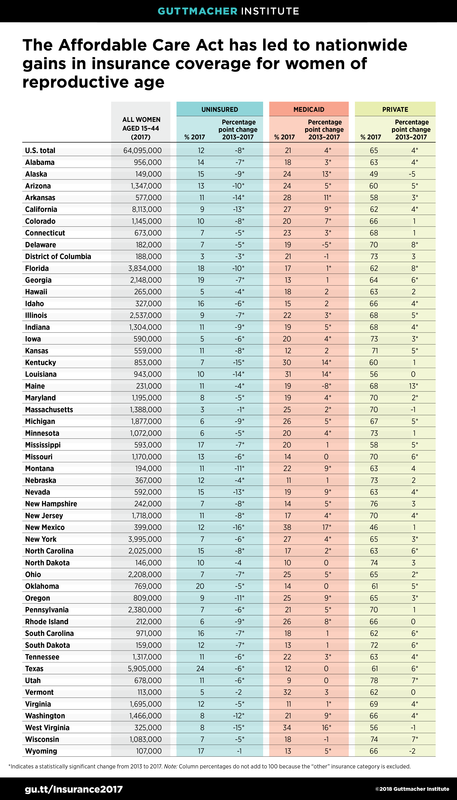 At the state level, improvements in insurance coverage across the country are tied to the ACA’s coverage expansions, particularly the major Medicaid expansion currently implemented by 32 states and the District of Columbia. The uninsured rate declined significantly in almost every state in the country between 2013 and 2017. Collectively, states that implemented the ACA’s Medicaid expansion experienced steeper declines and had one-half the uninsured rate in 2017 (8% vs. 17%) than nonexpansion states. These gains in insurance coverage have major implications for access to health care in general and sexual and reproductive health care in particular. That is because Medicaid and private insurance include robust coverage for many sexual and reproductive health care services, including family planning services and supplies, and maternity care. In fact, Medicaid accounts for three-quarters of all public dollars spent on family planning in the United States and covers half of all U.S. births. The November 2018 elections brought new opportunities to expand insurance coverage in several states. In Maine, governor-elect Janet Mills has promised to implement a Medicaid expansion, which the state’s voters approved via a 2017 ballot initiative; outgoing Gov. Paul LePage has refused to comply. Voters in Idaho, Nebraska and Utah passed similar ballot initiatives in 2018 to expand their Medicaid programs. The incoming governors in Kansas and Wisconsin also support Medicaid expansion. The prospects in those states also depend on the legislature; notably, the Kansas legislature approved Medicaid expansion in 2017, but then-Gov. Sam Brownback vetoed it. Nevertheless, all of these gains continue to be threatened by the actions of conservatives in the Trump administration and Congress, who spent 2017 and 2018 working to repeal or undermine the ACA and making it more difficult for people in need to obtain Medicaid coverage. The impact of these efforts—including Congress’s repeal of the ACA’s requirement that individuals maintain health coverage or else pay a tax penalty, federal regulations promoting short-term plans exempt from many ACA requirements and “waivers” allowing states to impose work requirements and other barriers for many Medicaid enrollees—may not be seen until data are available for 2018 or later.